The Chagrin Documentary Film Festival is proud to announce the acceptance of the following films to be screened at this inspiring festival from October 12 to October 16, 2011. Tickets will be available for purchase, beginning September 5, 2011, at the Festival website: http://www.chagrindocumentaryfilmfestival.org. The inaugural Chagrin Documentary Film Festival was held in October of 2010 and included over 90 documentaries from 26 countries. Mary Ann Ponce, Festival Director, states, “ We congratulate the accepted films and are proud to present a Festival which gives a voice to talented filmmakers.” Marc Benson, President of Hamlet Village commented, “Last year’s inaugural Chagrin Documentary Film Festival took Cleveland film lovers by storm. The Festival was not simply entertaining; it challenged and provoked our thoughts and imagination with compelling and beautifully crafted films from all over the world." 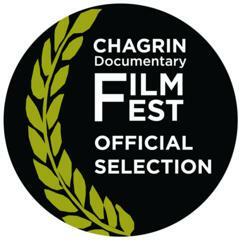 The Chagrin Documentary Film Festival is a program of Fevered Dreams Productions, a non-profit, 501(c)3 organization dedicated to enabling talented filmmakers to tell their unique stories. All donations are tax deductible as provided by law.